Enjoy a one (1) night stay here at the Resort at Squaw Creek in a Deluxe Accomodation room. Also included is $100.00 towards food and beverage at Six Peaks Grille, Cascades or Sandy’s Pub. Resort at Squaw Creek rests at the base of Squaw Valley ski area, just minutes from Lake Tahoe. A California resort in an idyllic mountain setting, Squaw Creek offers ski-in/ski-out access to the mountain and 405 luxurious resort rooms and suites that welcome guests with a "mountain meets modern" ambiance. 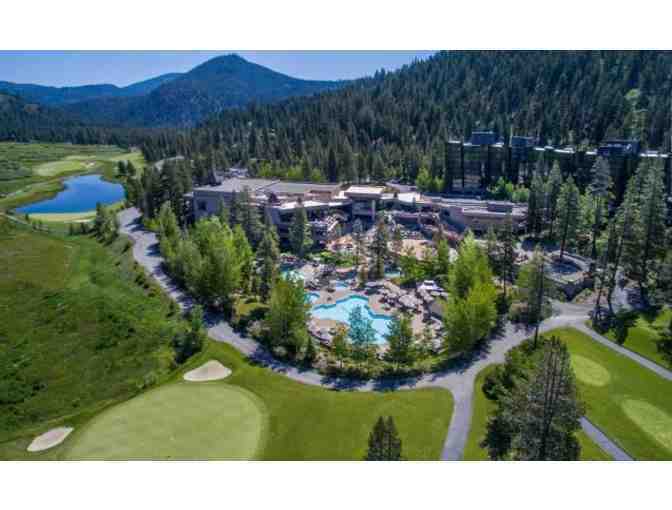 A year-round mecca of Lake Tahoe activities, the resort boasts a championship golf course, cross-country ski center, fly fishing center, ice-skating rink, heated swimming pools, water slide, and scenic hiking and biking trails. Whether you're seeking an exciting family vacation or looking for a world-class corporate conference destination, Resort at Squaw Creek provides everything you need to create cherished memories. Restaurant: Tax and gratuity not included. Subject to availability. This is a one-time use voucher; No change given. Not replaceable. Not redeemable for cash.